Located in Houston Texas, the nation's third largest city, the George R. Brown Convention Center boasts 1,800,000 square feet and four exhibit halls placing the George R. Brown facility within the top 10 largest convention centers in the country. Historic downtown San Antonio is an ideal and peaceful setting for the beautiful 1.3 million square foot Henry B. Gonzalez Convention Center. The Dallas Convention Center is a world class full-service convention center that offers "warm and friendly southwestern hospitality". With facilities capable of handling any convention need, easy access, and it's unique environment in a vibrant downtown, the Dallas Convention Center is a smart choice for your next convention or event. 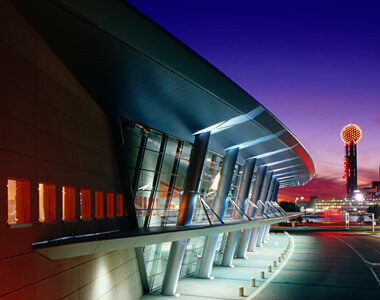 The Dallas Convention Center is home to over 1 million square feet of exhibit space. The Convention Center houses Exhibit Hall F which is 203,000 square feet and is the largest column-free exhibit in the US. We offer a vast selection of trade show and convention booth rental equipment including: LCD & Plasma Rentals, Video Wall Rentals, Sound System Rentals, Pipe & Drape Rentals, Staging Rentals, Laptop Rentals, Projector Rentals, Wireless Microphones, Amplifiers, Presentation Equipment Rentals, and much more, all to the Dallas Convention Center and the surrounding area of Texas. So if you are planning a trip to a trade show in Dallas then give us a call, relax, and let your Tech Travel agent book your Dallas Computer Rental needs for your next Dallas Convention Center show. *ConventionVendor.com is not affiliated with or in any way authorized by The Dallas Convention Center. ConventionVendor.com is an independent nationwide technology rental provider and this page in no way implies exclusivity.